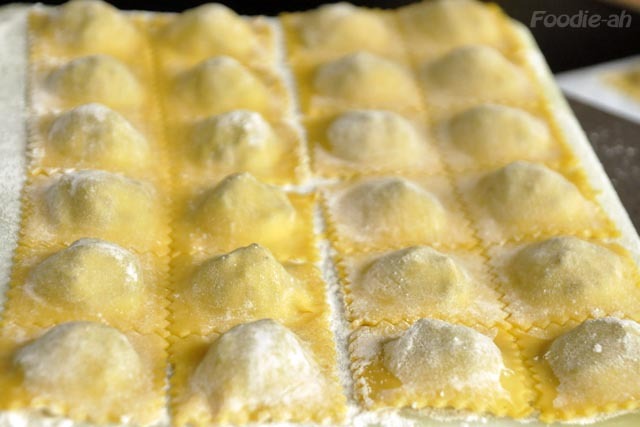 During my last vacation in Tuscany, while staying at the Olive Oil resort Villa Campestri, I had the fortune to try these ravioli, combined with one of their gourmet olive oils. Once back to Singapore, nostalgia from the trip pushed me to combine my memories of Tuscany with some of the tools I brought back from the trip. 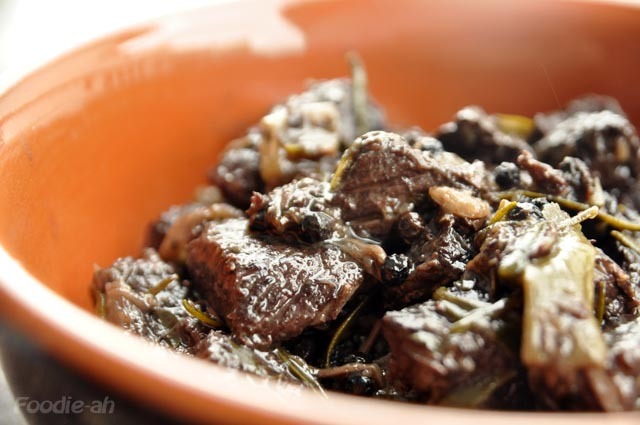 Sear the meat in a casserole until browned, then remove it from the heat, embed the sage, rosemary and black peppercorns, add the whole bulb of garlic, sprinkle with a couple of pinches of salt and pour the wine until the meat is completely covered. Put it in the oven at 150C covered with a lid and leave it there for 2 to 3 hours, until the meat is totally tender. Check it every hour to ensure that the meat is still covered by the wine. Finally, uncover it and let it continue until there is only about half a centimeter of juice left at the bottom of the casserole. 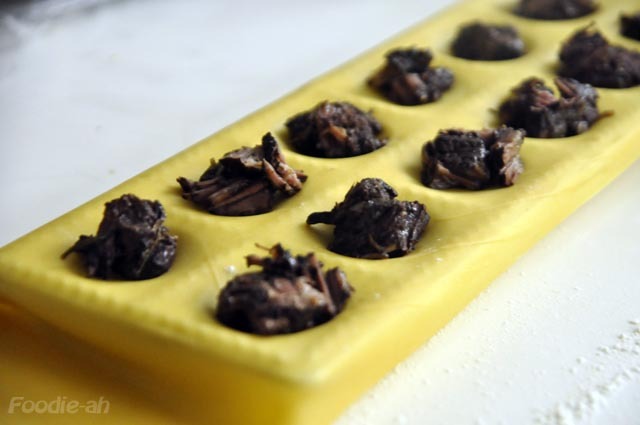 Remove from the heat, let it cool and store in the fridge overnight if necessary. Make some pasta dough, as I described in one of my older posts, then flatten some into 1mm thick sheets. I used a ravioliera to make them consistent, but you can do this without it. Lay the first sheet of dough, place equal portions of meat at equal distance, then overlay the second sheet. Make the two sheets stick by pressing them with a rolling pin, then using your fingers, ensuring that no air remains trapped in between. Finally, cut across the edges with an undulated dough or pizza cutter. Finally, for the sauce, you need some prime quality olive oil (not the sort that you buy in the supermarket!!). 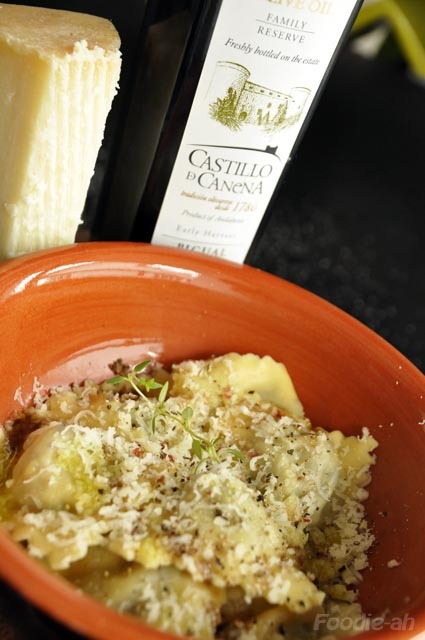 I used a premium Spanish olive oil: Castillo de Canena. Alternatively, you can order premium olive oil directly from the olive oil resort here. You will also need some Sardinian Pecorino, which in Singapore can be bought from Giorgio Ferrari. Finally, I recommend the use of mixed peppercorns (pink, white and black) for a rounder flavour. 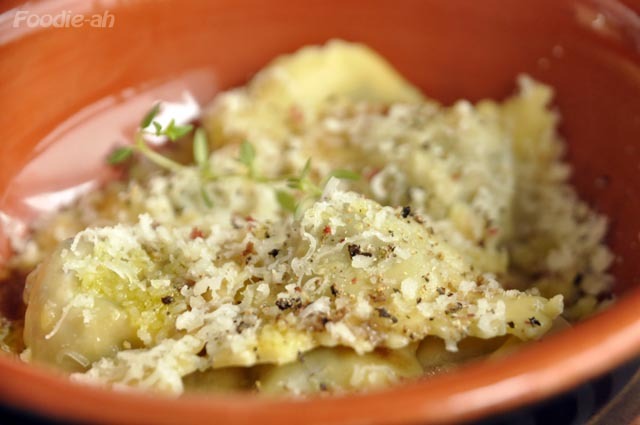 Simply boil the ravioli for 3 minutes, drain, then plate with grated Pecorino cheese, a cap of olive oil, and plenty of freshly grated peppercorns. Garnish with a sprig of sage, rosemary or thyme. This concoction of quality ingredients brought my palate straight back to Tuscany!